Last year, I read David Mitchell’s The Thousand Autumns of Jacob de Zoet, a novel set in 17th-century Japan at a time when Dutch traders were the only westerners allowed into the country. While I enjoyed the book (it is a David Mitchell creation, after all), I couldn’t help but feel that he had missed an opportunity as I was eager to learn more about life in Japan at that time, rather than just the trading post at Dejima where most of the novel was set. Luckily for me, Shusaku Endo’s Silence (translated by William Johnston) fills that gap nicely – and, more importantly, is a very, very good book. The first part of the book is written in the form of letters written by the Portuguese priest, and this is apt as the novel as a whole is concerned more with Rodrigues as an individual than with his mission as a whole. In a country where Christianity, especially for those who refuse to renounce it, can be punishable by death, being a missionary is something of a suicide mission and only possible for someone with the strongest of beliefs. However, when people suffer for those beliefs, when innocent souls are tortured, burned and killed, when God refuses to intervene… is it possible to maintain your beliefs? Can you keep the faith in the face of God’s continual silence? As can be expected from the title, silence plays a major role in the novel. Rodrigues, determined as he is to maintain his faith, must nevertheless question God’s lack of intervention at a time when, in his eyes, it is most needed. As the people he has come to save lay down their lives for his religion, he struggles to accept their sacrifices and see them as part of a greater scheme. One of the more interesting points about this book is the idea of a western point of view, written by a Japanese author. Endo is a Catholic himself, and his sense of confusion and compromise comes across in his portrayal not only of the suffering Rodrigues, but also of the intriguing Kichijiro (of whom more later…). One thought I had at the start of the story was that it would be very easy to turn this book into a pro-Christian anti-Japanese tale, but the writer balances the sympathies very nicely. For those Christians among you, it might appear that the Japanese behaviour is unjust, but the reality is that the missionaries were illegal spies in a foreign country, expressly breaking the law and inciting disobedience amongst the local people too. And let’s face it, the Catholic church itself was no stranger at the time to intolerance and cruelty against people with different opinions to their own.. The prevailing opinion seems to have been that whatever the intentions of the Christian missionaries, Japan was a ‘swamp’, a field in which Christianity’s roots could not take hold, and the ensuing perversion of the tenets of the religion (along with the suspicion that conversion was paving the way for later subjugation to the European powers) proved that the best path forward was to eradicate the foreign faith, described by one of the characters as an ugly, barren woman. Rodrigues suspects several times that the Japanese form of Christianity is not all that it should be, observing that many villagers appear to attach more importance to the Virgin Mary than they should, but is this any different to his own obsession with Jesus – in particular with the beauty and expression of his face? In fact, in light of the immense sacrifice made by these early Japanese martyrs, who really had the greater belief in God? This is a thought for the reader to ponder as you follow Rodrigues through all the stages of his own private ordeal, until he is forced to decide what his religion means to him and what is more important – theoretical doctrine or human kindness. I was going to end my review there until I remembered that I read a short story by Endo in The Oxford Book of Japanese Short Stories last year – and decided to go back to take a second look. Unzen is the tale of a Catholic novelist who travels to the scene of the torture of early Christians to see for himself the place of their pain and suffering. At the time, it wasn’t one of my favourite stories among the collection, but after reading Silence, the tale takes on a whole new dimension. The main reason for this, apart from the continuation in the main theme, is the reappearance of perhaps the most fascinating character in Silence, the apostate Kichijiro. He plays the role of Judas to Rodrigues’ Christ, and in Unzen we get a glimpse of his backstory as the novelist reads of his tearful attendance at the torture of those Christians who refused to renounce their beliefs – and were therefore scalded by hot springs for weeks, before being burned at the stake. Throughout Silence, Rodrigues views Kichijiro with distaste, bordering on disgust, but despite his obvious cowardice, the Japanese apostate is a much deeper character than first appears. His weakness is tempered by his inability to truly abandon his religion, and he finds himself continually drawn to his former friends, even following them on the road to their martyrdom, hoping to appease his conscience a little with offerings of food to the doomed Christians. Indeed, it is also tempting to view his apostasy in a more positive light, seeing as he remains alive, yet still a believer. This is one of my all time favorite books, I found it to be a difficult read, but also very thought provoking and moving as someone who is both a Christian and lived in Japan for a short time, I am fascinated by this time period in history. Great review, it made me want to read the book again! Very interesting remarks on the difficulties of converting large numbers of Japanese to Catholics-conversion here in the Philippines was done at he point of a sword!-as you said, Catholics are far from without shame in their treatment of those who follow other ideologies. This book, along with Endo's Wonderfull Fool, is very powerful to me. As a Christian my entire life, he brings up concepts to which their are no easy answers. I remember feeling confused by God's silence, too, but then understanding that we (His followers) are not to be silent for then we are in fact denying Him. I think He's silent because He doesn't interfere; He lets us make our own choices. Will we deny Him? Will we suffer for Him? All very thought-provoking stuff. My review is here. I bought that collection of short stories at your recommendation last year, and now I need to look up the one by Endo. This is such a powerful book. Thanks for your review. I think it's hard to recognize God's silence but as Bellezza says, that's when we make our own choices. I'm a Christian so this spoke to me on a very personal level. Wrong title meant stained glass elegies although the sea & the poison is still a great book. I'm so glad that you enjoyed it. I read this for the second time earlier this year (with my church's book group) and found it held up beautifully to a second read. And it made a great book for discussion! On the second read, I was especially taken with Kichijiro. I agree with you that he may very well be the most interesting character in the book. Okay, I'm requesting this one from my library immediately. It's not one I've heard of before, but it sounds terrific. Such thought provoking review and book! I'm glad you enjoy it. As I plan to read this sometime soon, I'll leave it for now and come back to your review later. Hope you are still around to listen to my thoughts. All the best. I usually reply to all comments individually, but I'm not sure I'm up to that here (sorry)! I can see how this book would resonate with Christians – Rodrigues' trial of faith is something that any believer (in any religion) will go through at one time or another. However, it's also fascinating in the sense of a clash of cultures, and the misunderstandings which arise from this. This is my first Endo book, and I'm kicking myself for not having read it sooner (I've had it on the shelf for a good six months now!). To anyone who has read more of his books, what else is comparable to 'Silence'? 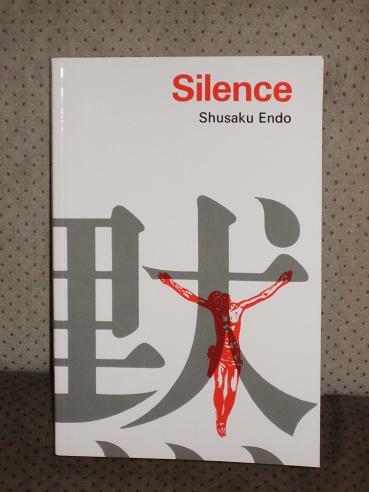 As a HUGE fan of Silence, and of Endo himself, I thank you for selling this book so well. You capture the book so well; one can also feel the plight of the poor Japanese Christians in your review. For your next Endo read can I humbly recommend The Samurai? It's kind of like Silence in reverse, when a Japanese Samurai diplomat makes a tour of Europe and the Americas, during the time when Japan is suppressing Christian faith in their country. Also keep an eye out for Endo's story collection, The Final Martyrs, which continues the whole theme of Christian martyrdom in Japan. Thanks again for a great review and for further opening fellow reader's eyes to an important book which seems to get sadly overlooked by many. My heart is warmed to find that you 'enjoyed' it so much. No worries, Rob 🙂 I think more people have read (and love) this book than you'd think, judging by the reaction I've had to this post, both here and on Twitter. …and, as we all know, it's 10% off time at the Book Depository again! I looooooove this book. It was a 5 star read for me. The short story sounds interesting and I'll definitely read it whenever I can find it.